"The stems can be tough on kale, so remove as much of the stem as possible." Heat olive oil in a large skillet over medium heat; cook and stir onion until tender, about 4 minutes. Add apples, vinegar, salt, and pepper; cover skillet and cook until apples are tender, about 3 minutes. 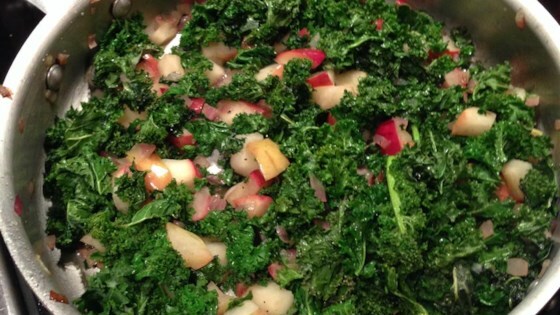 Add kale; cover and cook until kale is tender, 4 to 5 minutes. The combination of the ingredients made for a delicious meal. I did add smoked sausage to bulk up this dish and it really complemented the dinner, I served it over rice. Yummy! Loved it...easy to make and healthy. I did add a touch of honey for additional flavor. Will definitely make again and again. Being a vegetarian and a fan of kale, I'm always looking for new meatless recipes to try. This was so good, I ate it as my main course for dinner.